Hello everyone! 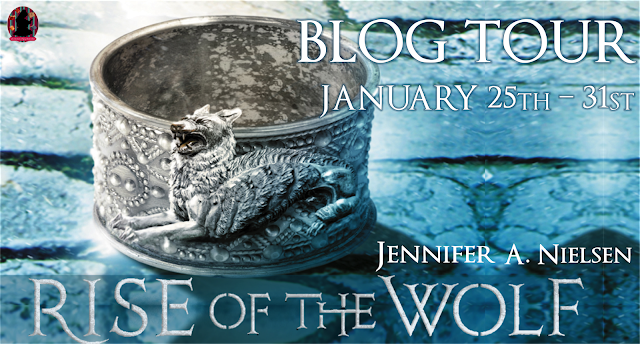 I'm excited to bring you guys my review of RISE OF THE WOLF! I enjoyed the first novel and if you haven't read the first book, you can check out my review here. It seems appropriate that I should write this review after I've written my midterm for Roman History. 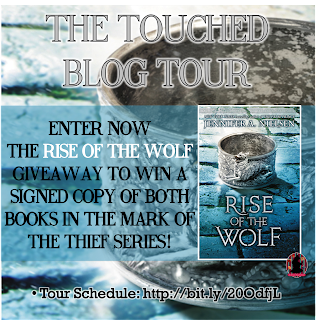 RISE OF THE WOLF starts off pretty much where Mark of the Thief ended. 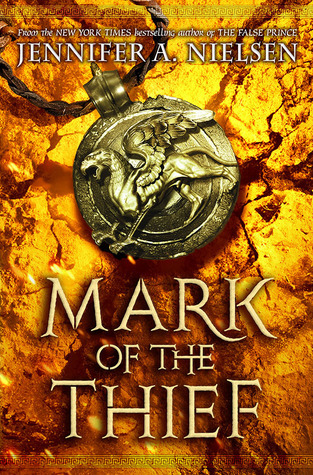 This novel is a very natural progression of the story that began in the first book. Nic is still suffering the consequences of his choice in the first book to pick up that bulla and it doesn't look like his suffering is going to end any time soon. Nic's choice to pick up that bulla and the resulting event of him becoming imbued with magic from the gods has thrust him into a battle of the gods that he has no place nor desire to be in. He was a slave when he gained the magic and the magic has bound him to another sort of slavery in which he must continue to fight for his freedom. Throughout the book, Nic is simply coping with the blows as they come and rolling with it. He has no control over his situation at all and he is very much at the mercy of both others and his situation. I feel like Nic hasn't really changed since the beginning of the first book and I don't quite know how to feel about that. Obviously things have happened to him and often traumatic events change a person. However, Nic retains that un Roman-ness about him that makes him such a formidable opponent against the Romans that have it out for him. Even in the midst of a competition, he refuses to cheat to win while his opponents are cheating to defeat him. His enemies are trying to tear him down at every turn and he continues to have that same outlook and his fatal flaw - his fierce love for family and his saviour complex. The budding romance between Aurelia and Nic felt strange and out of place for me. While this romance does factor into the plot and has an impact on Nic, I didn't really feel the chemistry between the pair. 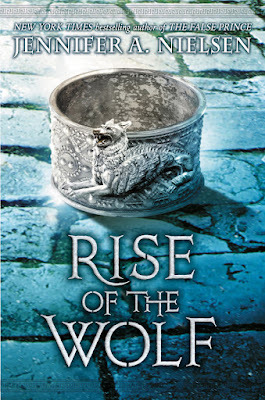 RISE OF THE WOLF is a good sequel to the first novel and while I enjoyed both this novel and the first one, this sequel fell just a little flat for me. I am curious about how this will end though and I look forward to reading the next book and hopefully things will turn out okay for Nic. What are your favourite time travel stories (tv shows, movies, books, etc.)? Well, obviously…my very favorite is OUTLANDER. Diana Gabaldon is my hero, and I’m fortunate enough to call her a friend. It meant the absolute world to me that she liked ‘Into The Dim’ enough to grace the cover with her blurb. She doesn’t do that for many books, so the day I got that news was one of the best days of my life! 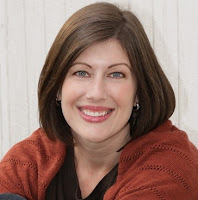 A lot of people don’t realize that she first wrote Outlander over twenty years ago. But over time, she’s brought historical time travel back in a huge way. 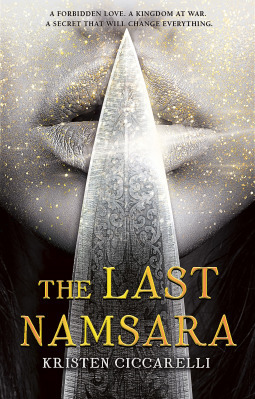 And now, with the show…it has become a MAJOR trend, especially in YA. I feel very fortunate that not only is ‘Into The Dim’ a forerunner of that trend, but also is the only one to have the ‘Queen of Time Travel’s’ stamp of approval. 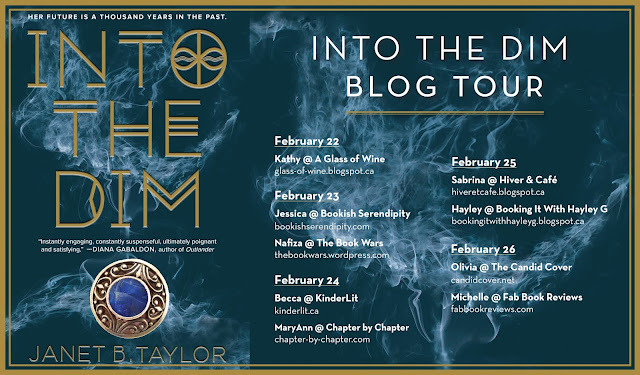 INTO THE DIM is a time travel novel revolving around Hope Walton, a phobia ridden 16 year old filled with grief over losing her mother to an earthquake. 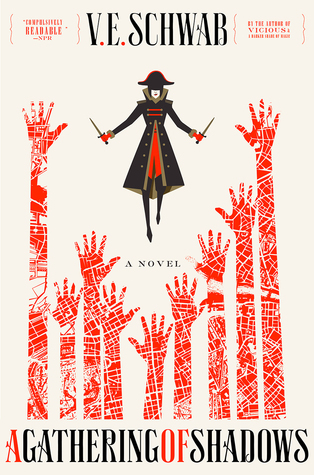 However, as she faces her fears and takes a plane to Scotland to meet her mother's family, she realizes that her mother is not dead, but in fact lost in 12th century London after a time travel trip gone wrong. Hope learns about her family's time travelling ways and makes it her mission to find her mother and bring her home, despite her many fears. 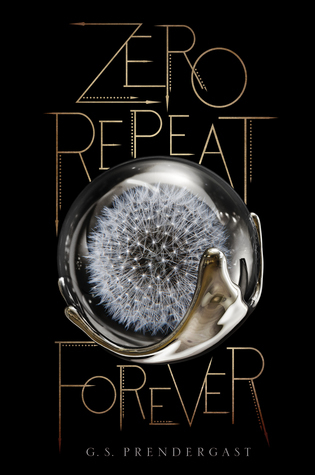 I have to admit, the first hundred chapters or so, I was bored and just sort of muddling through the pages. I mean it's a novel about time travel and I just wanted the history to start already! It may just have been me, because I'm very much into action sequences and for things to be happening. However, I understand the need for this bit in order to set up the character of Hope and her circumstances. One of the things I love about time travel stories is learning the limitations of the system put forth and how those limitations factor into how the story plays out. The whole secret society of time travellers intrigued me and I really enjoyed how the history of the time travelling and limitations were laid out clearly in the beginning. Hope is ridden with phobias that she's developed and she learns to face her fears out of pure necessity as she is thrust into this world of time travel and the need to rescue her mother. She has an eidetic memory and I love how it was described when she remembered things as sort of like holographic diagrams in her vision. I imagine it sort of like the way Cassandra from The Librarians sees her equations. And while Hope was interesting, I thought Bran Cameron is a much more interesting character. He's a mysterious boy with one blue and one green eye, that Hope accidentally encounters when she goes out for a horse ride. He's mysterious and interesting and I can't really say more than that because he's pretty integral to the plot. As the story's pace picked up, so did the action and oh boy did it move. I was flipping the pages, the fight scenes playing out in my head. There were definitely some scenes and reveals towards the end I did not see coming. I look forward to seeing these new discoveries being addressed in the next book and also more of the time travel system! 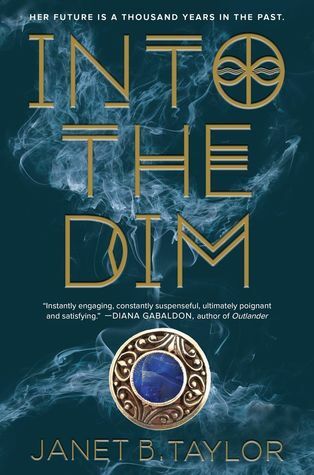 INTO THE DIM is a fun, action packed historical time travel novel that has interesting characters and great historical detail. It's a story I can easily see being adapted into a tv series with (hopefully) lots of detail in the historical accuracy. Don't mind me, sobbing in the corner over here. I'm just a tad heartbroken over here. 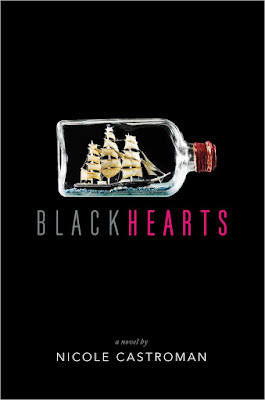 Let me just start off by saying that Blackhearts is phenomenal. I love this book. It's been a while since a book has grabbed me by my heartstrings and doesn't let go. I started reading this on the bus to school and then I couldn't stop reading it when I got to school. I decided to go to school early to write an essay that I hadn't started yet, but I still hadn't started it, because I HAD to know what was going on next. 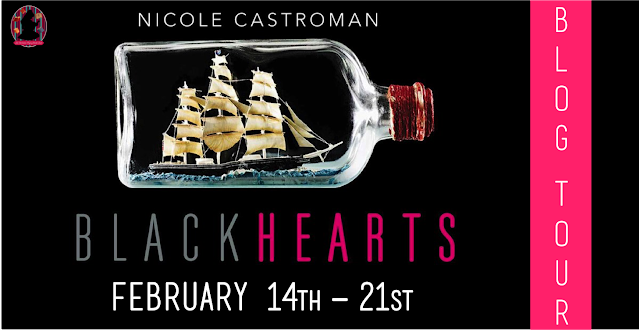 BLACKHEARTS tells the story of Edward "Teach" Drummond, before he became the legendary and notorious pirate, Blackbeard. It also tells of Anne Barret, the illegitimate daughter of a merchant and a slave from Curaçao. With her parents dead and no money to her name, she finds herself working on the Drummond estate as a maid. 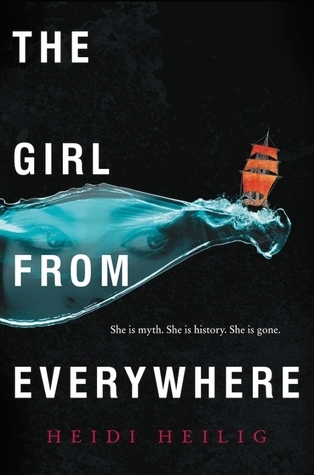 All she wants is the freedom to choose her own life and to travel to the place her mother was born, just as all Teach wants is out of his arranged engagement and to sail the seas as captain of a ship. The chemistry between Anne and Teach is palpable. From the first moment they met each other, there was a tension between them that most certainly developed into something more. I loved reading their interactions and the slow development of their relationship. I ship the two so hard. I love Anne. She's intelligent and educated, thanks to her father teaching her how to read and educating her. She's stubborn and it's clear to others and to Teach that there's something about her that makes her more than just a maid. Anne is a realist and she's very aware of her situation and what she must do in order to get her freedom. Teach is the son of a successful and wealthy merchant, whose father has aspirations of becoming an aristocrat. This leads Teach to rub elbows with some of the more elite families of Bristol. Despite the fact that he doesn't want the marriage arranged between him and the daughter of an aristocrat, he is under the thumb of his father, especially if he has any hopes of acquiring his inheritance. I love this novel and it'll be one that I'll be thrusting upon my friends in the very near future. The ending of this novel left my heart in pieces, but it was well worth it. 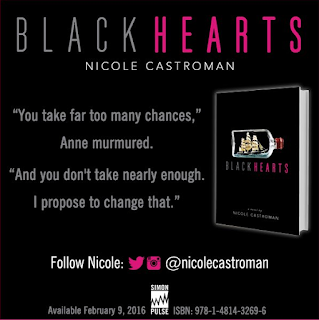 BLACKHEARTS pulled me in from the first chapter and sucked me into the world of Anne and Teach and still has yet to let me go. I hope you guys read this novel and love it just as much as I have. 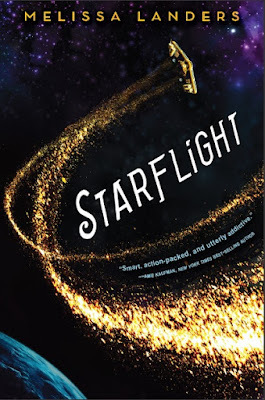 [Book Blitz] Starflight by Melissa Landers! I'm excited to talk to you guys about Starflight today! This book sounds awesome because SPACE and I'm getting a teensy bit of a Firefly vibe from the synopsis. I LOVE Firefly. 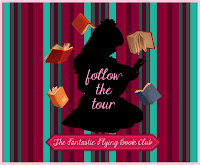 So to start off this post, here's some info on the book and then I'll turn the reigns over to Melissa Landers!